Is flying with snow dangerous? Although it is approaching spring, the time approaching the flights is facing snow covered or heavy rains. 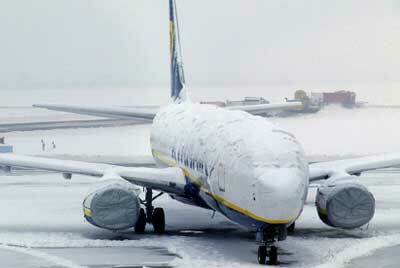 Surely if you have a planned flight you’ll wonder if it’s safe to travel with snow. Do not do anything before a snowfall, when there are 10 centimeters of snow the airport closes or with fog of 100 meters it is decided to cancel flights. But it is a fact that security is in danger, airports take the necessary measures to preserve the health of their passengers and crews, canceling or closing airstrips. There are several factors that the traveler must take into account if his flight occurs with snow, apart from leaving the panic aside. In order to safeguard the safety of each flight, the track operators carry out cleanings, removing the snow and preventing its accumulation, all in order for the takeoff and landing to be optimal. In the event that the ice covers the track, the thing gets complicated as it is more complex to eliminate than snow and requires the scraping of the pavement of the track and can damage the deck. In these cases, if the ice sheet is a risk, you choose to cancel the flight. But not only the condition of the track is taken into account, of course the plane is checked and in what situation the wheels and wings are, since I could accumulate snow or ice. The technicians have products based on hot water and alcohol that keep the fuselage clean when the weather is not right. In this way, the accumulation of ice and snow is avoided. Also, the heat released by the engines is a great help to melt any excess solid water. We have to rely on the pilot and the crew, they are the first to watch the air for our safety and in case of detecting that it is not safe to make a flight they will communicate it in order to stop the takeoff. All the pilots begin their journey in the air with clear skies, but over the years it sharpens their senses and abilities to visualize great distances with cloudy skies. In addition, they are very cautious and consult the status of the storm in certain areas with other colleagues who have landed there or are at that moment in that airport, as well as with the control tower that will help guide the pilot with adverse weather. Storms are another fear, what about lightning and thunder? That does not panic, the rays do not disable the planes, they can affect the electronic devices and during the maneuvers of landing that aquaplaning is generated, as it happens with a car, but when this moment approaches the control tower and Track operators are prepared to safeguard the maneuver. So if you intend to fly during these days of rain and snow, simply let yourself be guided by the airport directions, if you cancel a flight or close tracks, do not get angry, remember that they do it for your safety.Also, if you want to fly much more quiet you can leave your car in the WePark car park, where you have roofed places to protect it from the inclemency of the weather. Can I fly in a pregnant plane?